Bereavement; P.J. Hnyes passed away on March 24th 2018 (peacefully) at Elmhurst Nursing Home, Glasnevin. Beloved husband of the late Mary, dear father of Anthony, Patrick (Pat) and William (Bill). He will be deeply and sadly missed by all the club members that knew him. P.J. and Mary K enjoyed their golf, they were the life and soul of the club. P.J was a great loyal and volunteer worker and represented the Club on numerous occasions. He will always be remembered for his unique sense of humour which we all enjoyed. Requiem Mass in the Sacred Heart Church, Templemore at 10.30 o’clock on Monday 26th. followed by burial in St. Joseph’s Cemetery, Templemore. “May he rest in peace”. The course; The weather famine is now over and there is constant play activity on the course, with the greens in superb condition and fairways and tee boxes now in trim after the prolonged winter. All competitions are now rescheduled and listed in the Locker room. The Spring League; The teams for the Spring League are now listed in the Locker Room and anyone not on the list can contact by phone or text to Liam 087 4115773 to put you name onto the selection list. Entry fee €20. All members are encouraged to give this league your full support. Juvenile Golf; All Juveniles are encouraged to take up the opportunity of the school term Easter break to play their golf to get ready for the Juvenile season ahead. Any information required by parents, contact our Juvenile Officer Pat O’Connell, by text or phone, 087 9205821. Communications; Text (SMS) messages are regularly been sent out to members. If you have not been receiving these messages it’s because your mobile phone number is not on the list or could be incorrect listed. To up-date your number contact our Communications Officer Martin Bohan by phone or text. Green Fee Reminder; “There is just one rate” The Green Fee for 2018 is now €10 for 9 hole or 18 hole. . The advantage of playing 9 holes of Golf in Templemore; Templemore Golf Course is available to all golfers, members and non-members and members from other clubs to get in your practice rounds, beginners, active retiree’s and families who want to take up the sport will get assistance from any committee member, here are some positive reasons for golfing in Templemore Golf Course; Good Outdoor Exercise; 9 holes + 2hrs. 18 Holes = 4hrs. Good Social occasions, Presentation Nights, Social Mixed, Senior Events and Away Trips. The Handicap System allows members of different abilities an equal chance of winning. Various Category of Memberships are available at different rates. (Membership rates are on our web site). Full Annual Membership €350 = Approximately, only 95c. per day. New members are the lifeline of the club, so all existing members are encouraged to tell all your friends to take up membership and test their skills on this challenging Golf course. Registrations Forms for new members are now available on-line on our web site, or at the club house or contact Martin Bohan 087 0509278 or any of the committee members. All are welcome. New Members; It’s encouraging to see that we have a number of additional new members this year. All current members are encouraged to introduce only “ONE NEW MEMBER” Lady or Gent, Junior or Student, Senior or Family, Active Retiree’s or any person interested in taking up the sport. It will be a huge advantage to building the club membership. 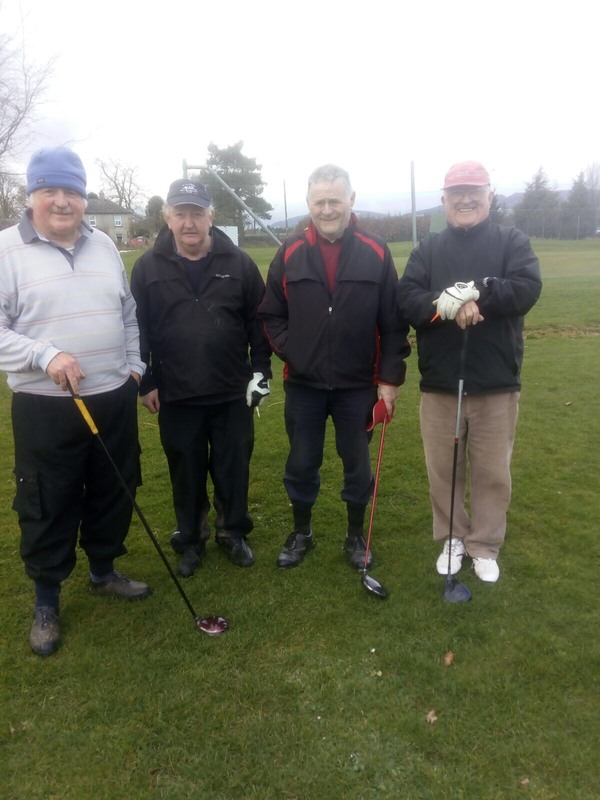 Seniors Golf; All were delighted to be back on the course. The next away date is Tuesday 17th. April in Tipperary Town. For further details contact Rody Cawley 086 3704229. Next club date; Thursday 29th. March. Get well message; All the club members wish John (The Saint) Stapleton a speedy recovery and hope that you will be back into action soon. Fixtures; Munster County Clubs; Round 2; Winners, Spanish Point/Doneraile-v-Templemore. The AIG Cups and Shields National Finals; will be in Thurles Golf Club on 21/23 September 2018. The Irish Mixed Foursomes National Final; will be in Miltown Golf Club 5/6 October 2018.